Starring: Jesse Eisenberg, Andrew Garfield, Justin Timberlake, Armie Hammer, Max Minghella, Rooney Mara, Josh Pence, John Getz, Douglas Urbanski, Joseph Mazzello. After the whimsical and slightly disappointing “The Curious Case of Benjamin Button”, David Fincher attempts another change of direction. However, It’s yet again, a surprising and not entirely successful choice of film from him. 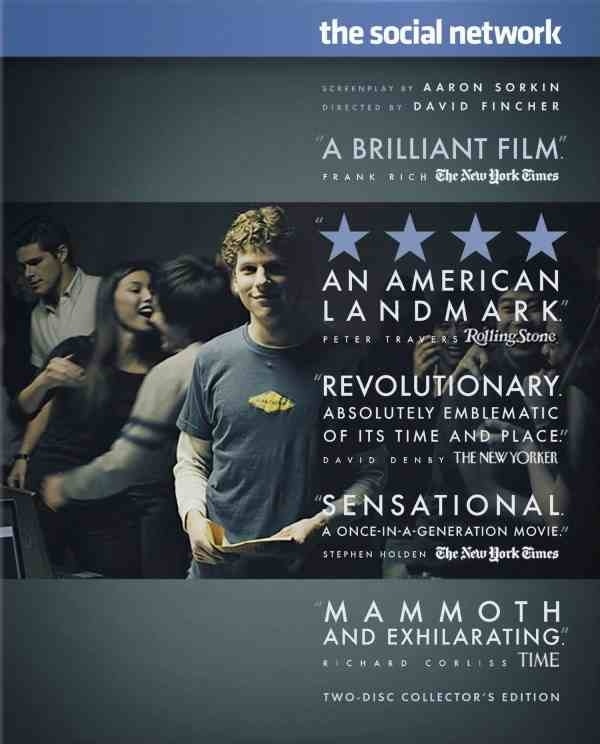 In an act of revenge after being dumped by his girlfriend, Harvard student Mark Zuckerberg (Jesse Eisenberg) hacks into all the local college computers and writes a scathing blog about her and exposes her to everyone. People seem to love it and the site becomes very popular, so Zuckerberg develops plans for a social network site called ‘The Facebook’, which becomes a near-overnight success. As ‘The Facebook’ grows Zuckerberg soon finds himself being the worlds youngest billionaire but drifts away from his best friend and business partner while infuriating a pair of jocks who claim he has stolen their idea, resulting in law suits and legal battles. Fincher forte is doing dark and I suppose in some ways this is just that, considering it captures the egotistical and greed fuelled invention of the world wide, social networking site “Facebook”. It’s just that his trademark style, seems to be absent. This could quite easily have been directed by someone other than the man that brought us “Se7en” or “Fight Club” as it mostly deals with the legal wranglings of Zuckerberg’s monetary compensation to friends and colleagues who claim the site was their idea. It’s long and it’s talky, if your not paying attention to the almost constant flow of dialogue, the film will leave you behind. The story is interesting enough but lacked any real depth and I don’t really think it merited a film about it, certainly not so soon after the events. The real life characters are not really a bunch of folk I’d enjoy spending time with either, even from the comfort of my own home. That being said, the solid direction from Fincher and fine performances, particularly Jesse Eisenberg as the confilcted genius Zuckerberg and surprisingly, Justin Timberlake as fast talking “Napster” inventor Sean Parker, keep it ticking along, all-be-it, with some slight buffering. I “like” it, but I wouldn’t “add as a friend”. This entry was posted on January 28, 2012 at 12:54 pm and is filed under Biography, Drama with tags 2010. You can follow any responses to this entry through the RSS 2.0 feed. You can leave a response, or trackback from your own site. Fun fact: today is Facebook’s tenth birthday. This movie just makes me hate Facebook eighty times more than I already do. Admittedly, I’d have to give this film another shot but I wasn’t impressed first time round, certainly not after all the hype it received. D’you know, I always thought I was alone on this one. I didn’t dislike it but it wasn’t as good as everyone was making it out to be. I’ll give it another go someday but I’m in no rush to do so.